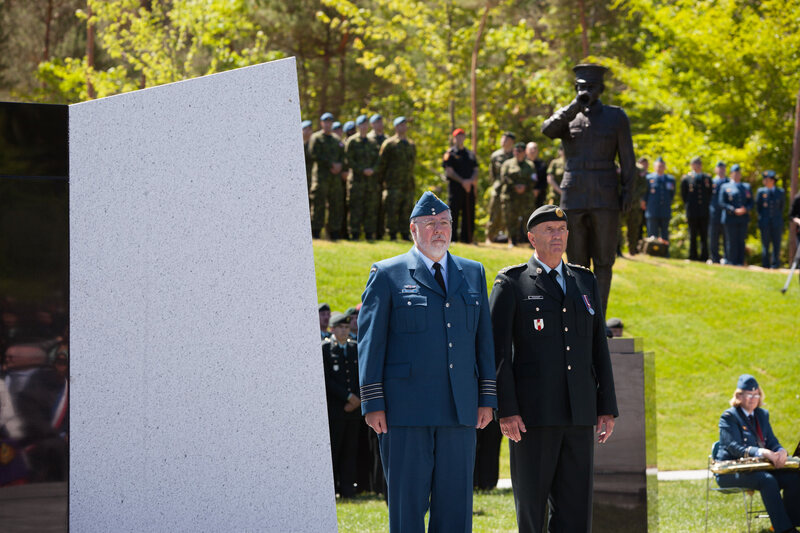 On June 9, 2016, I was honoured to photograph the unveiling of the Base Borden Legacy Monument. 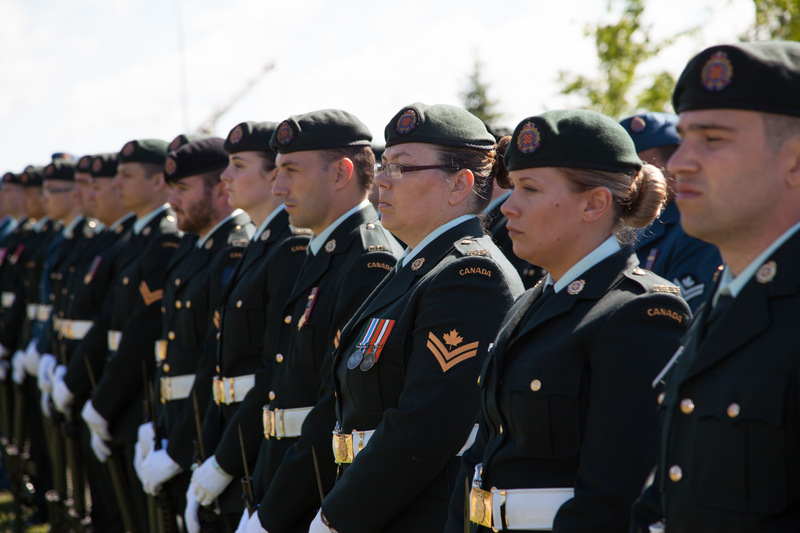 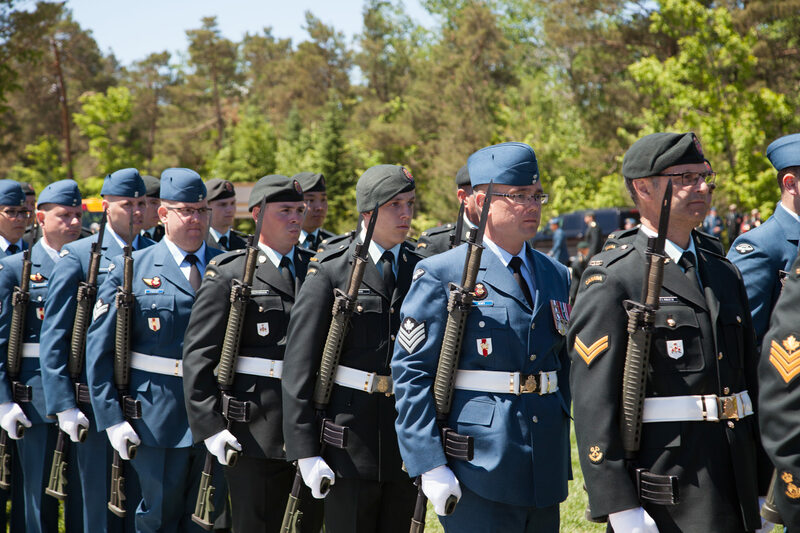 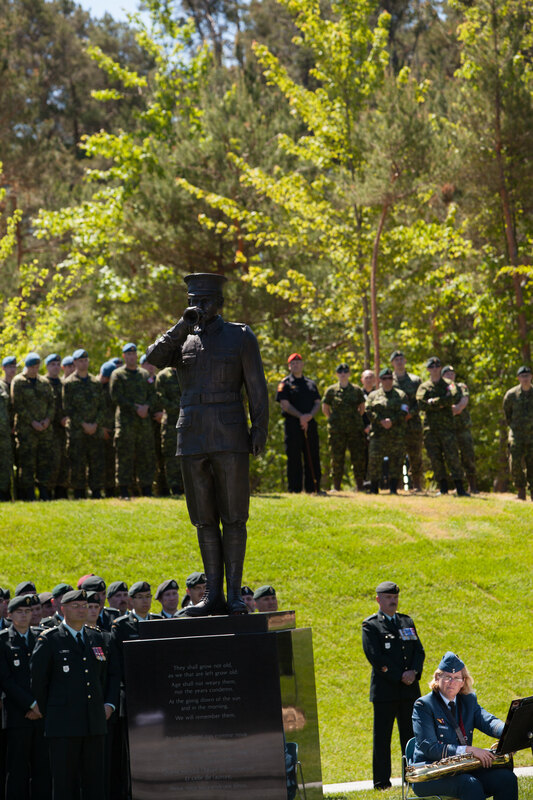 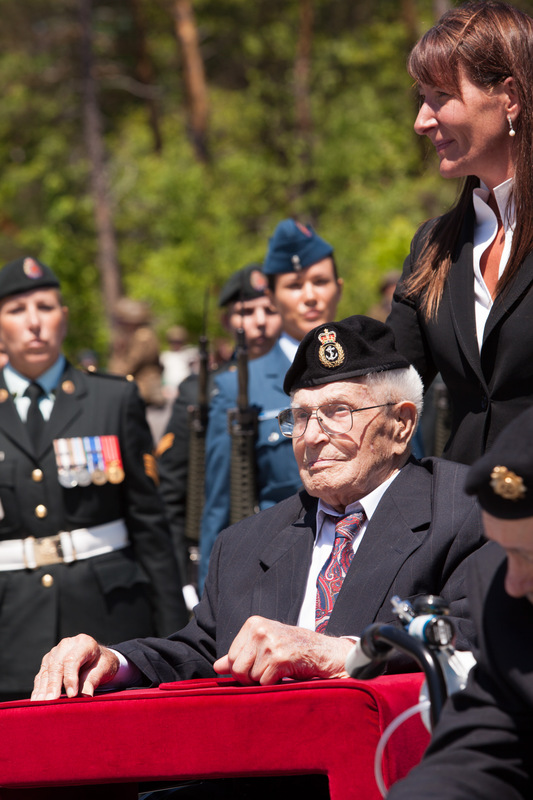 The unveiling ceremony was part of Base Borden’s 100th anniversary celebrations. 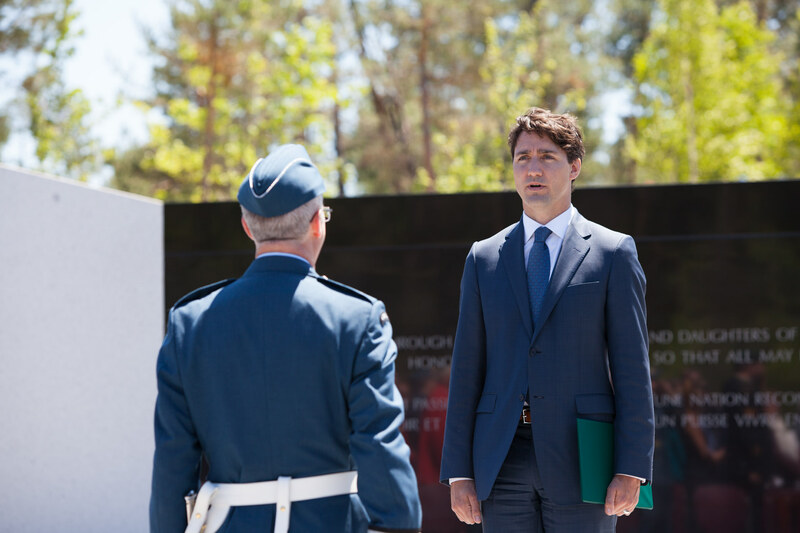 It was a deeply moving ceremony, and one that I will forever remember. 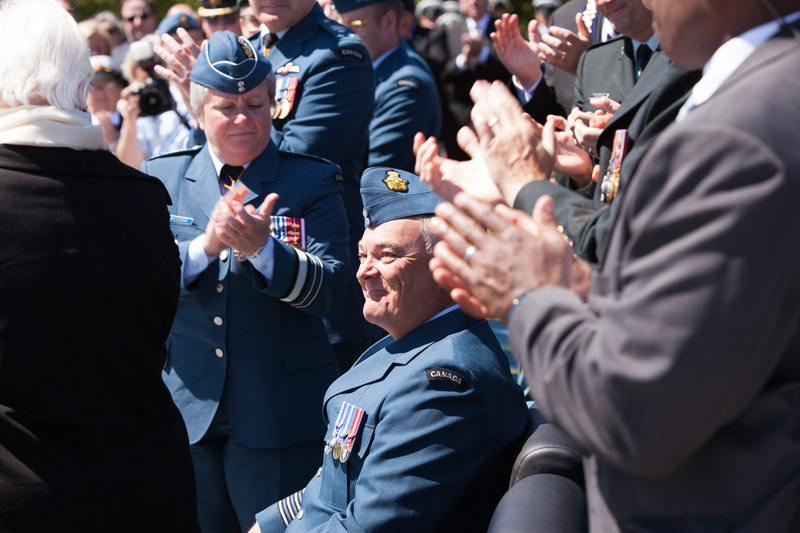 The Borden Legacy Project was spearheaded by Honorary Colonel Jamie Massie along with financial contributions of local businesses and residents. 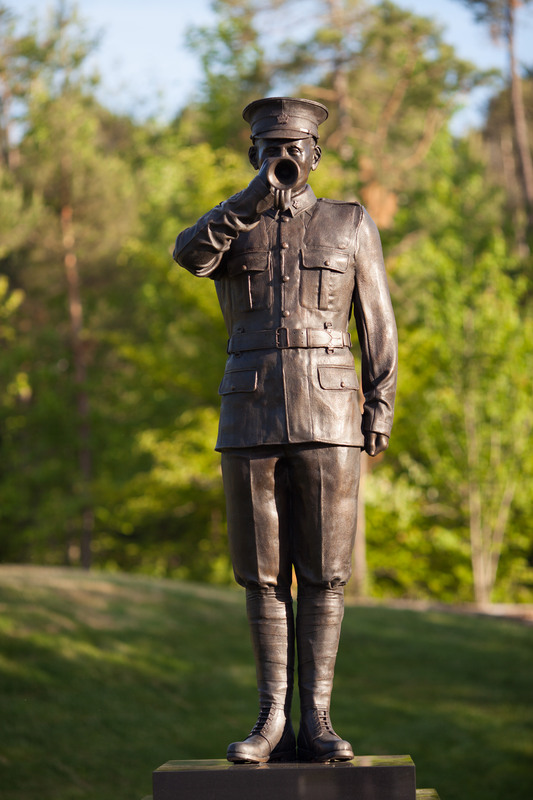 The monument was created by local artist Marlene Hilton Moore. 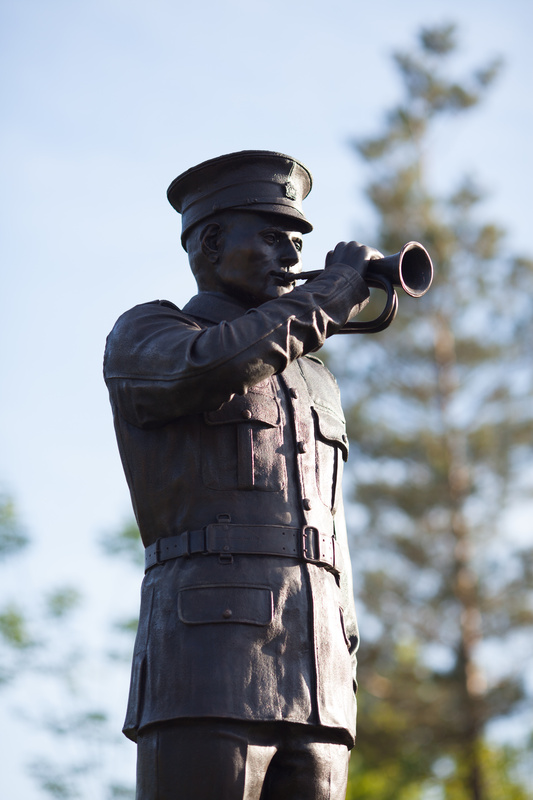 It is an impressive Memorial Wall made of highly polished black granite with white granite at one end and a sculpture of a First World War bugler. 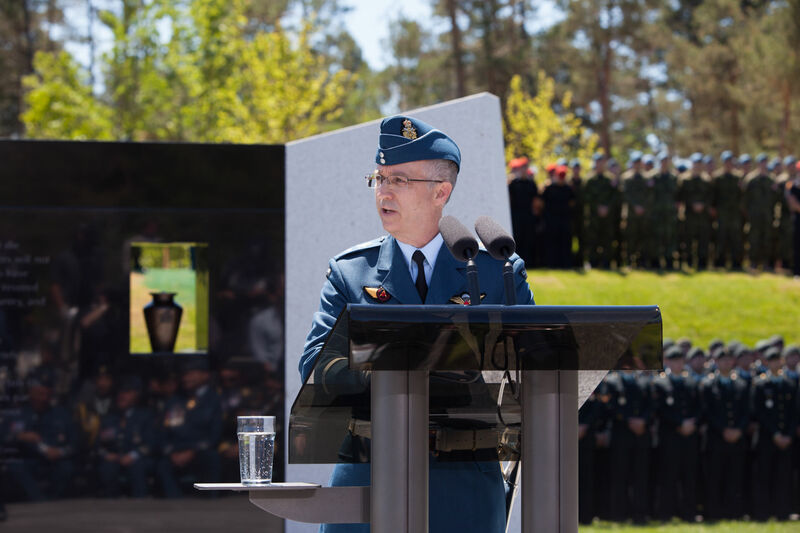 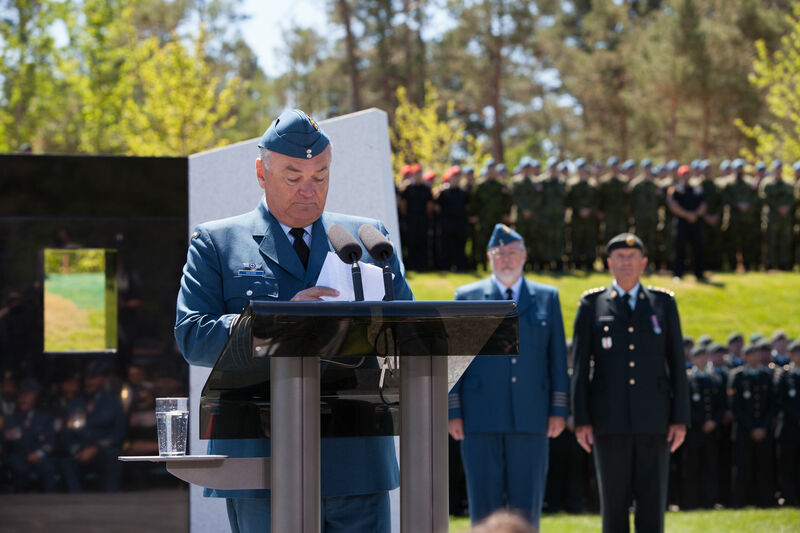 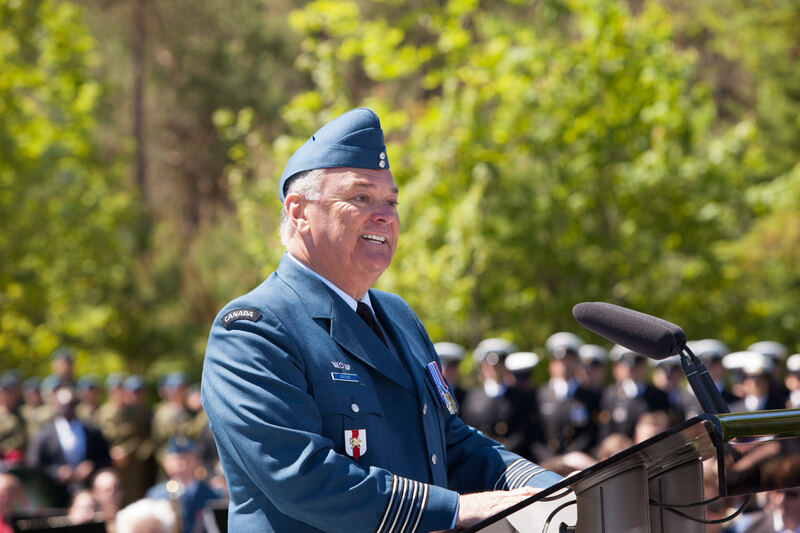 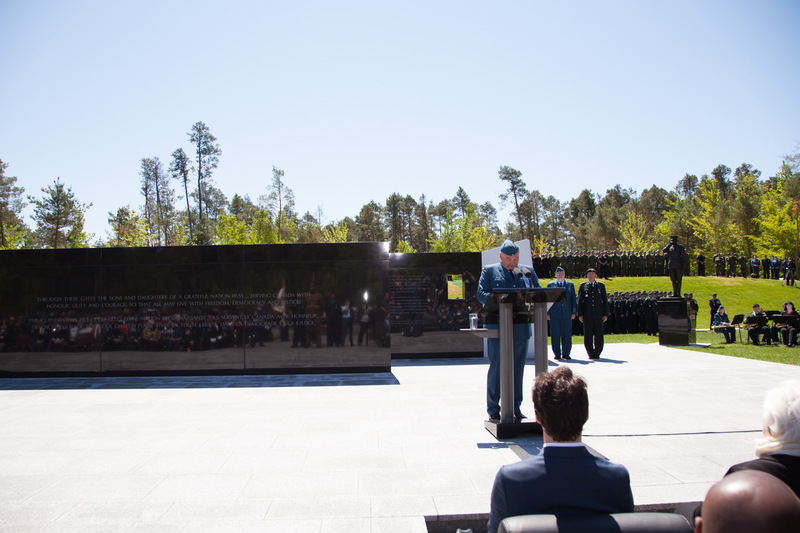 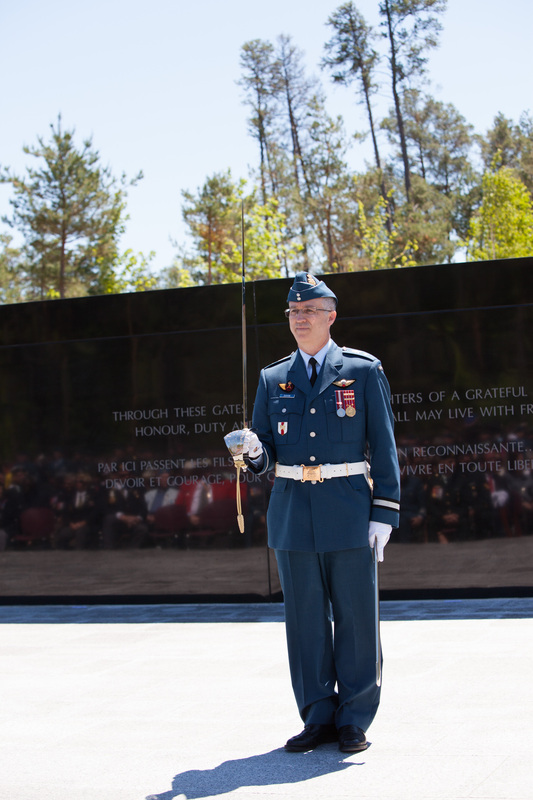 The monument sits atop a 40 by 60 foot podium near the entrance to CFB Base Borden, and is a monument that will be treasured forever in our community. 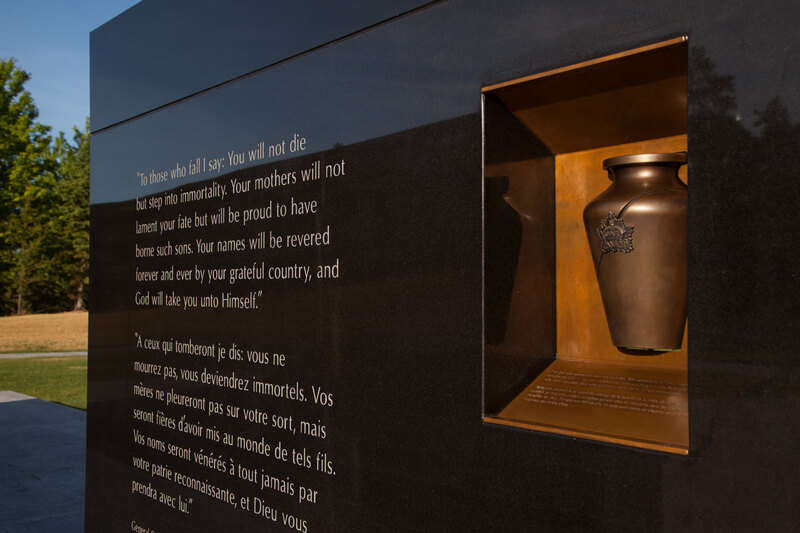 Engraved on the monument in both English in French is the following quote. 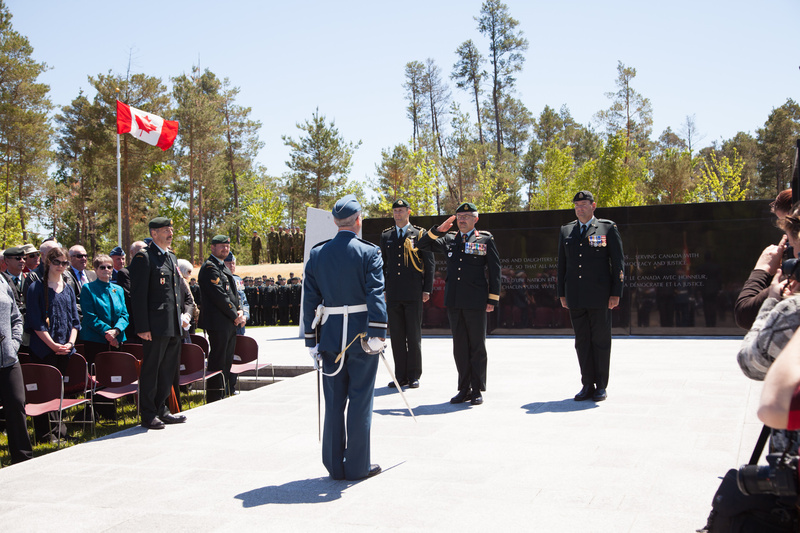 In June of 2015 a group of delegates from Simcoe County including Honorary Colonel Jamie Massie, Barrie Mayor Jeff Lehman, former Chief of Staff Rick Hillier joined Canadian ambassador to France, Laurence Cannon, members of the Canadian Armed Forces, the French Forces and the Vimy Foundation at a ceremony at Vimy Ridge to patriate sacred soil from the Battle of Vimy Ridge in April 1917. 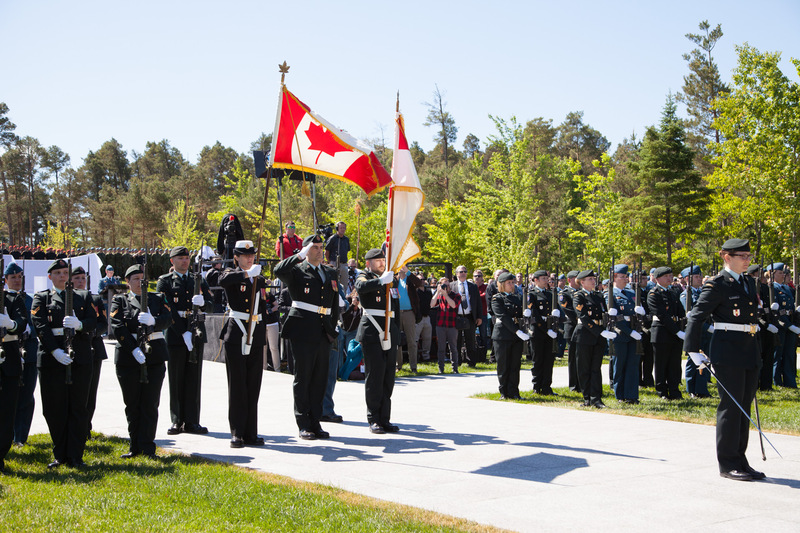 The soil contains DNA remnants of the 3,598 Canadians who were killed and more than 7,200 who were wounded in the battle. 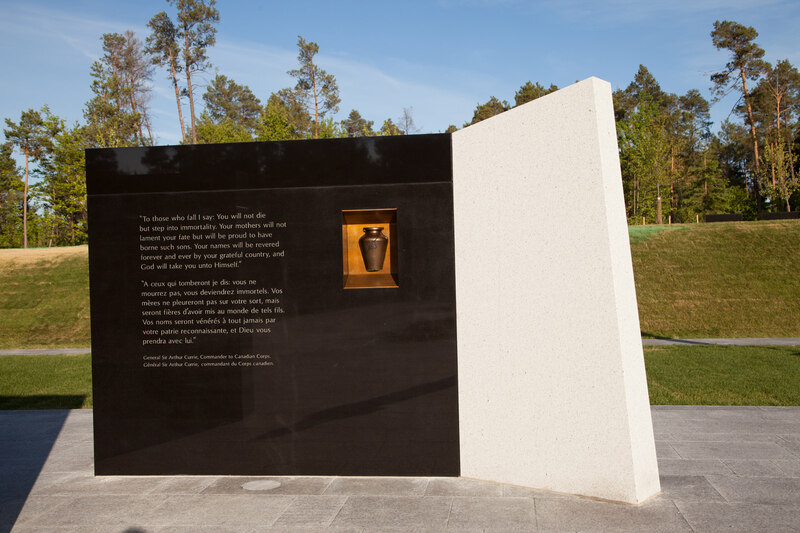 The sacred soil was brought back to Canada and was encased in a bronze urn that was placed and permanently enshrined in the Borden Legacy Monument during the unveiling ceremony. 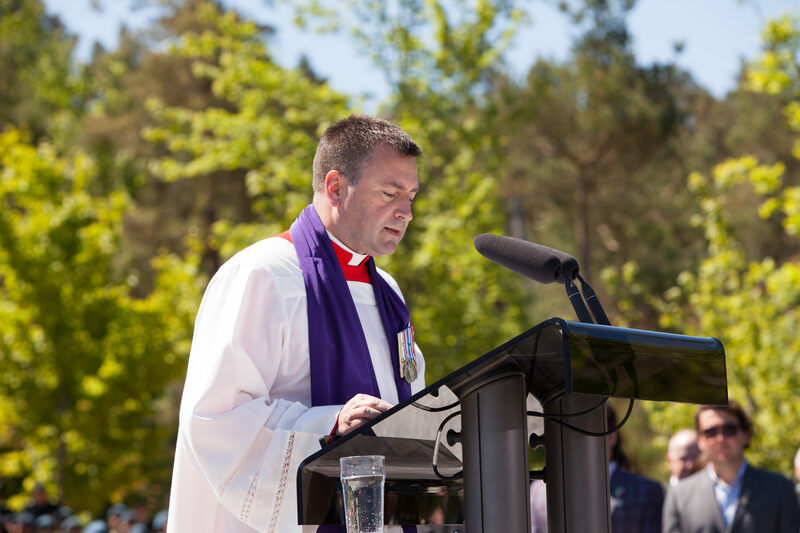 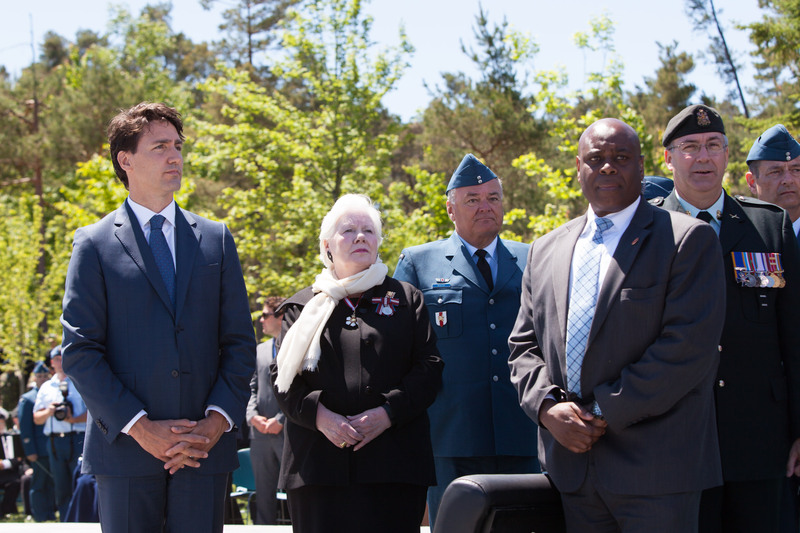 This was the first time that soil from Vimy Ridge has been repatriated to Canada. 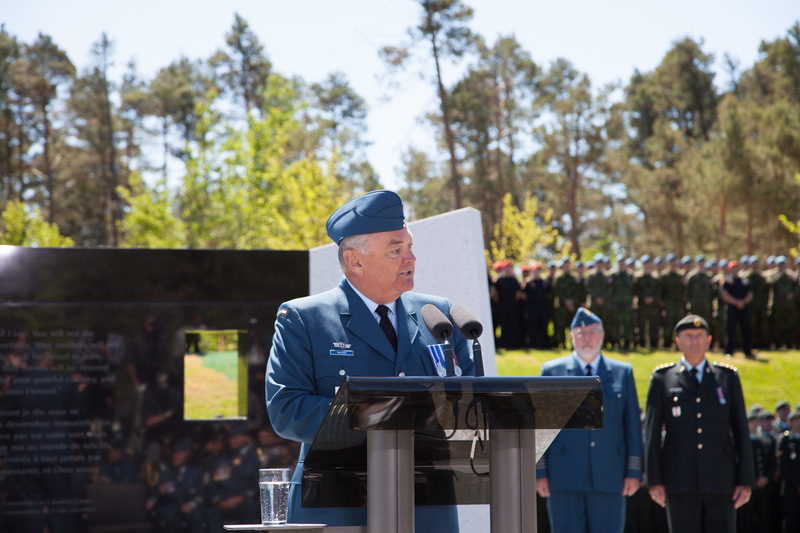 The repatriated soil has personal significance to Honorary Colonel Jamie Massie. 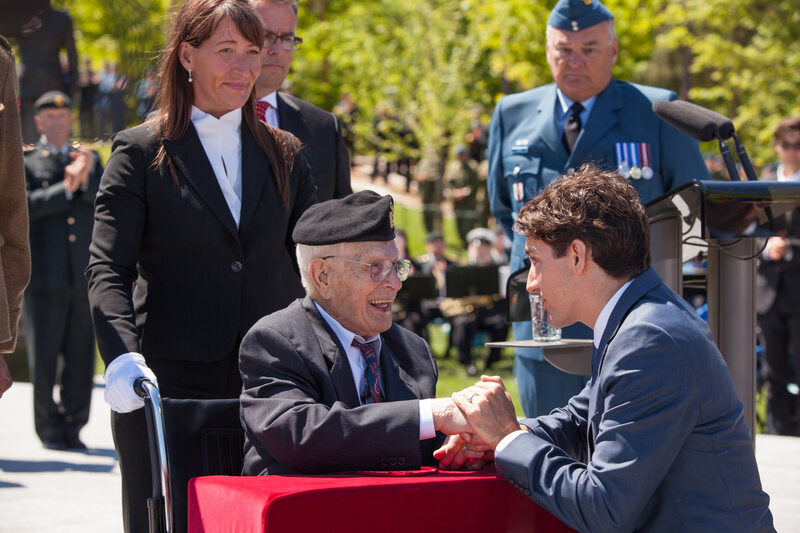 His grandfather, Pte. 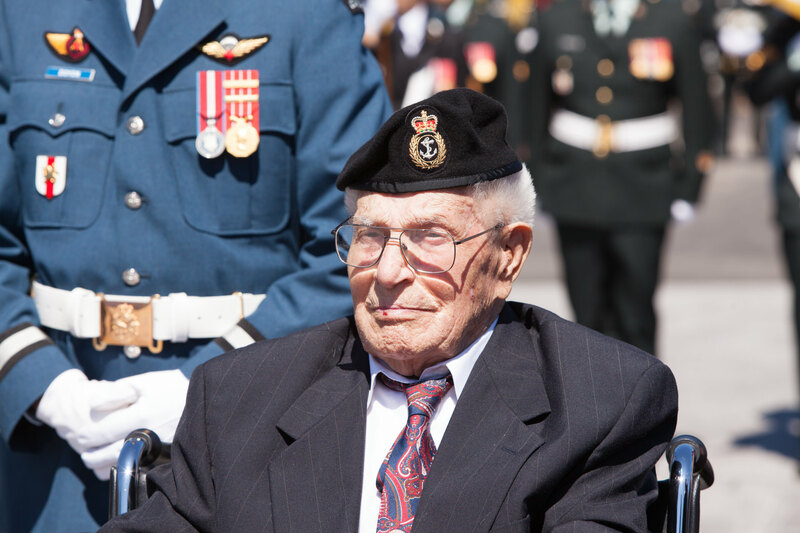 Frank Samuel Silvell, lost his leg in the Battle of Vimy Ridge. 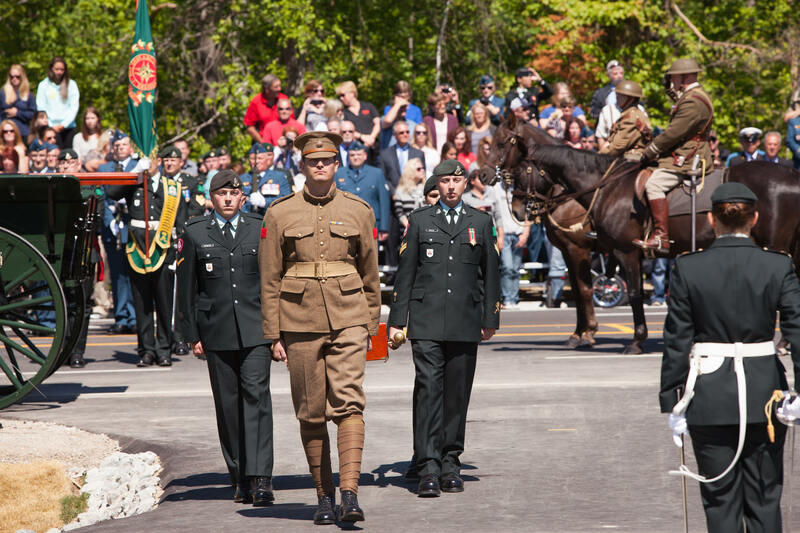 The sacred soil from the battlefields of Vimy was brought back to our community to honour our troops and their families, our community and our country. 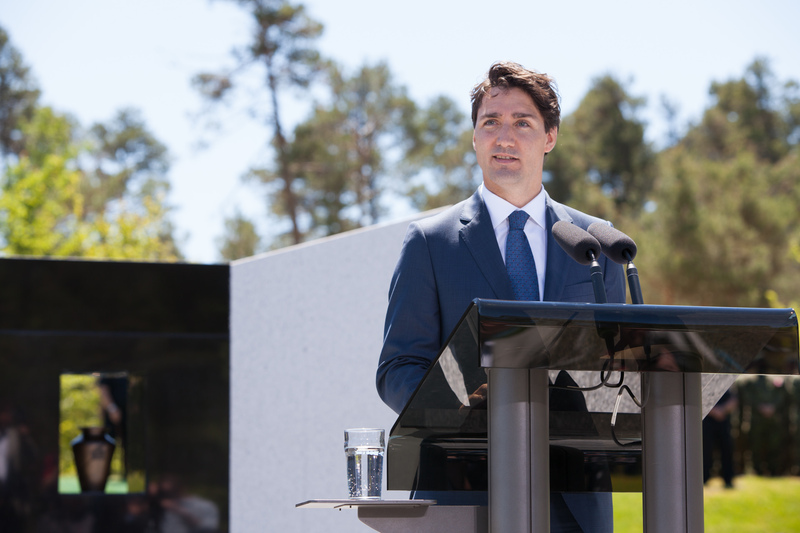 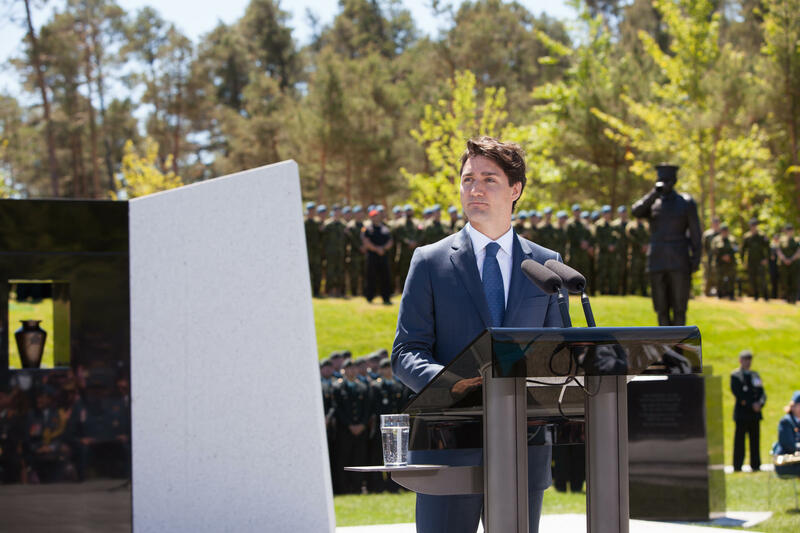 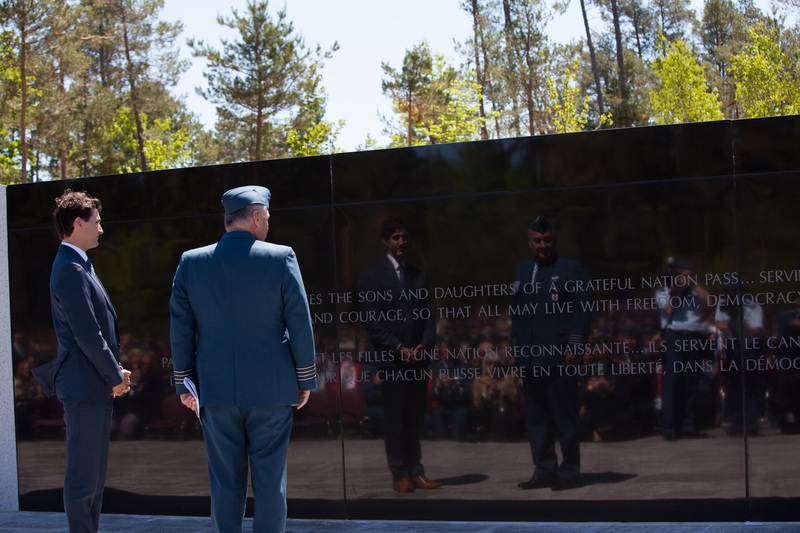 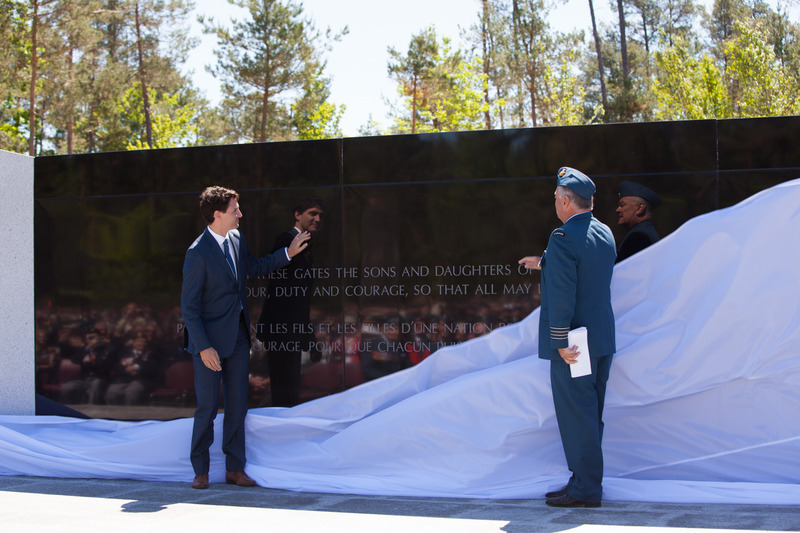 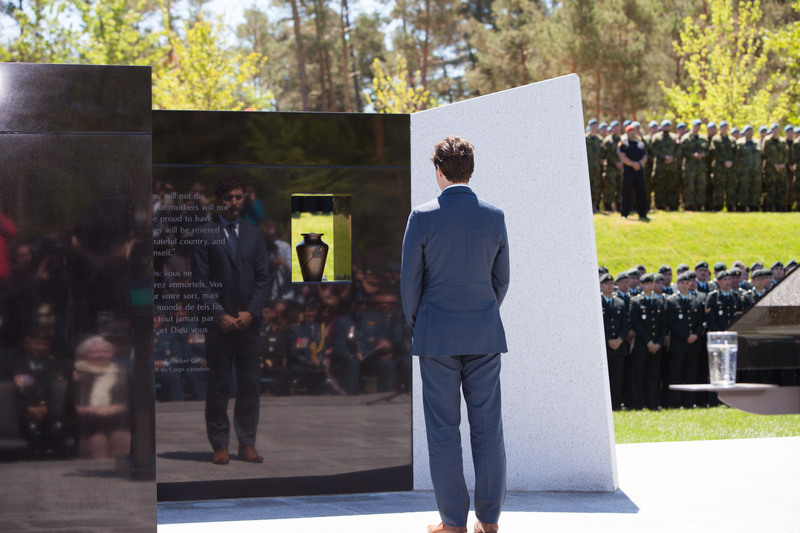 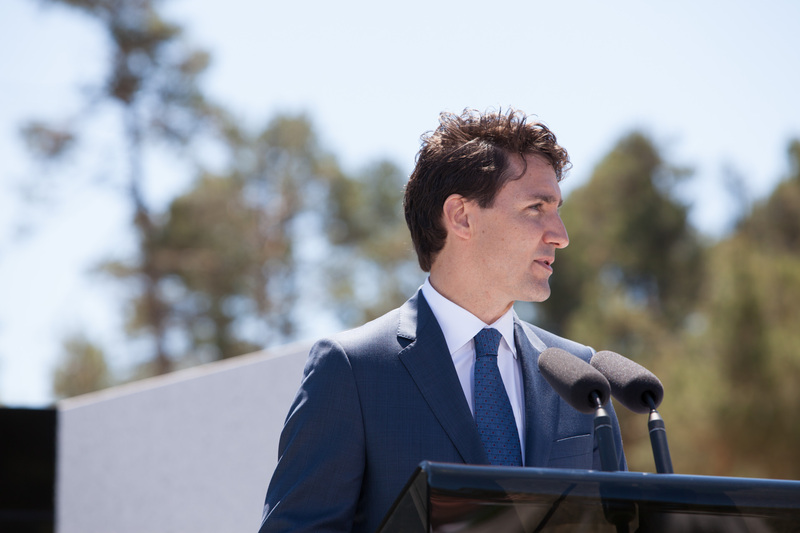 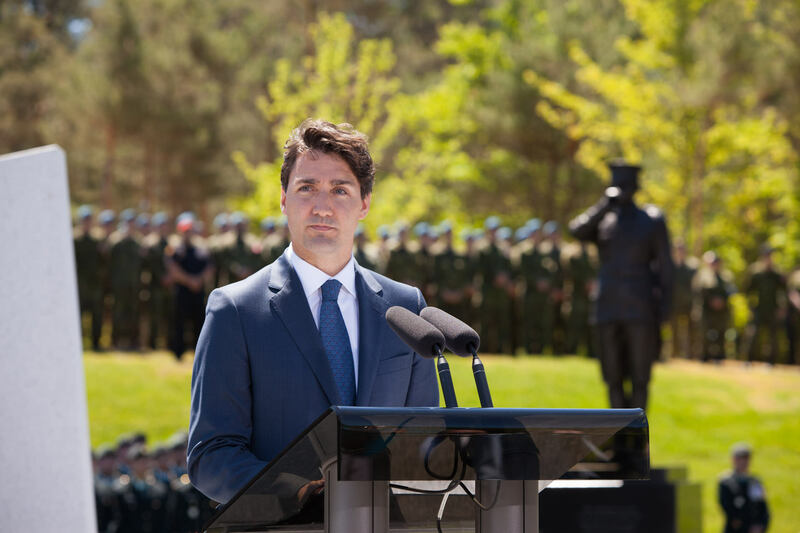 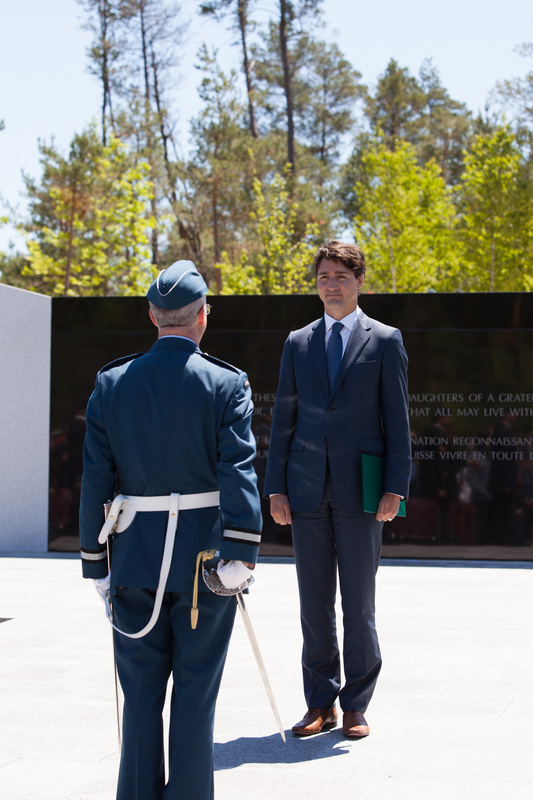 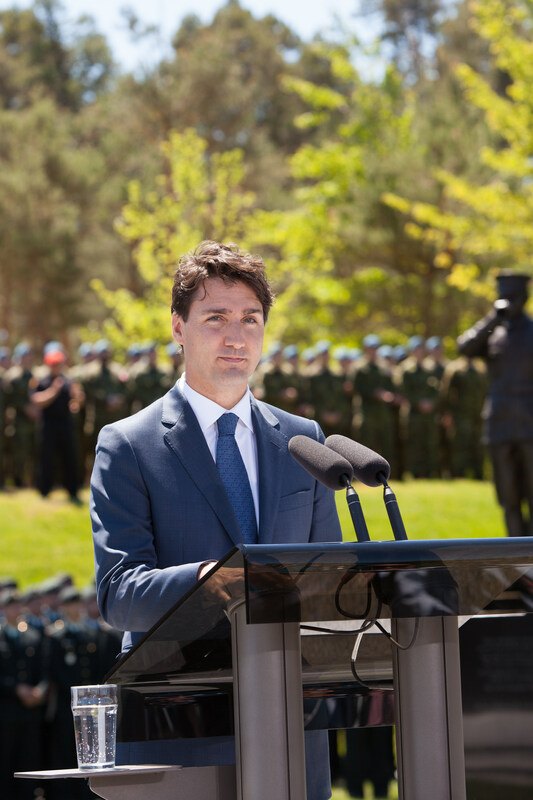 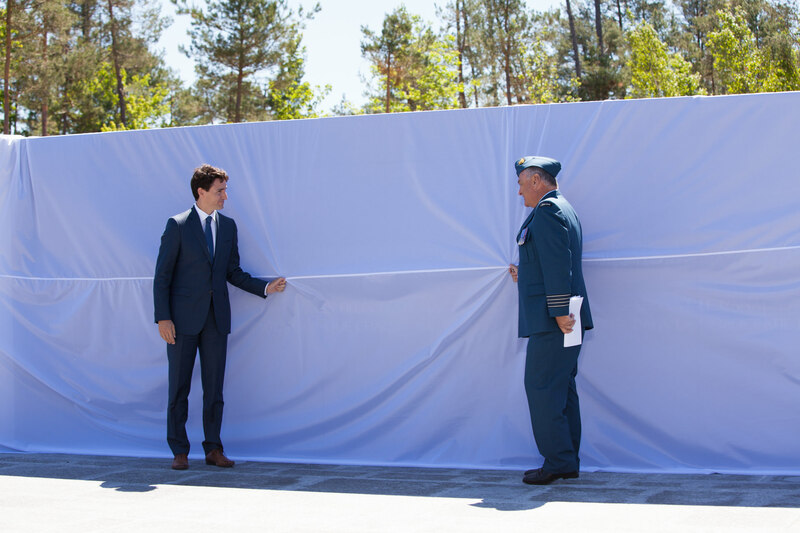 Prime Minister Justin Trudeau visited Canadian Forces Base Borden to participate in the unveiling of the Borden Legacy Monument and to help celebrate the 100th anniversary of Canadian Forces Base Borden. 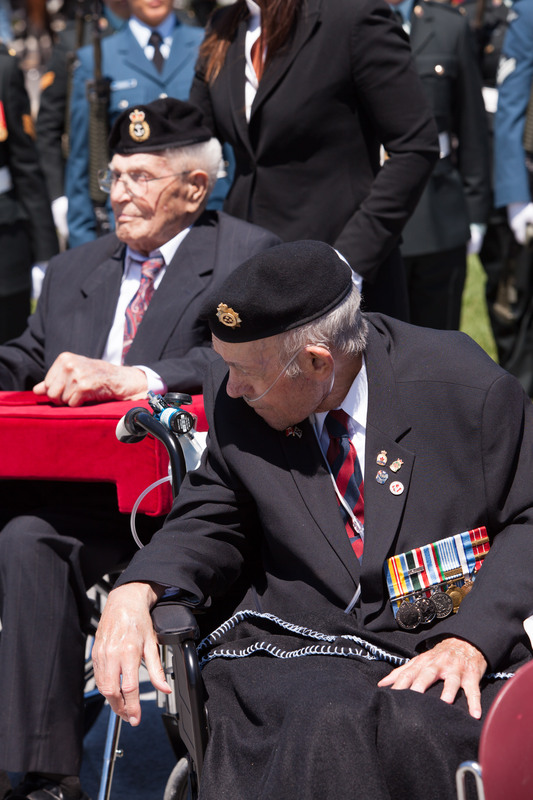 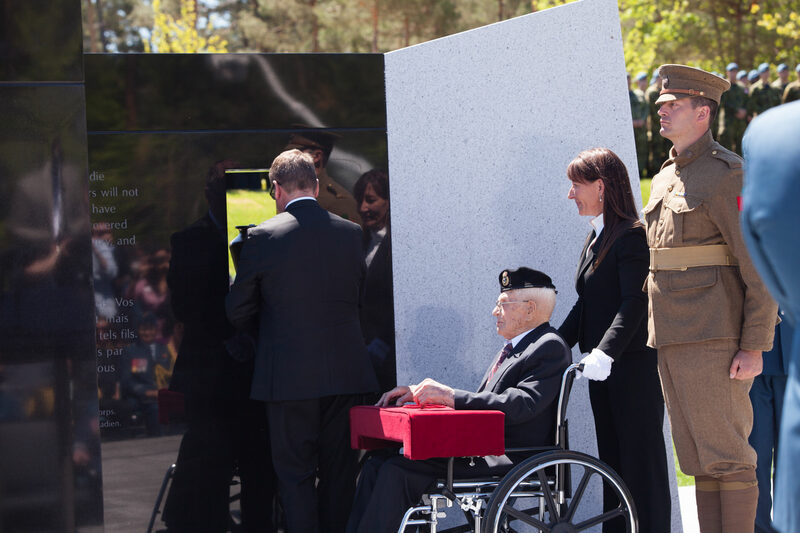 The sacred soil was carried to the Memorial Wall by Second World War veteran, Norman Burling. 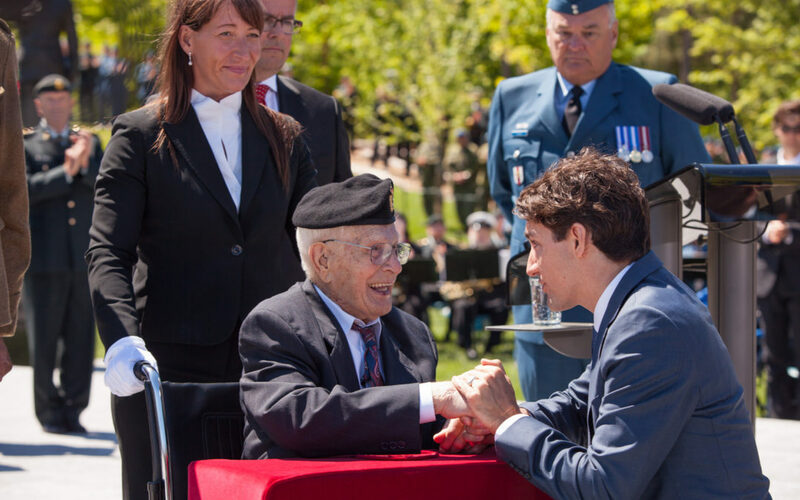 Prime Minister Justin Trudeau kneeled down to give thanks and speak with Norman just moments after the soil was placed in the wall, and the emotion and energy of this moment was palpable. 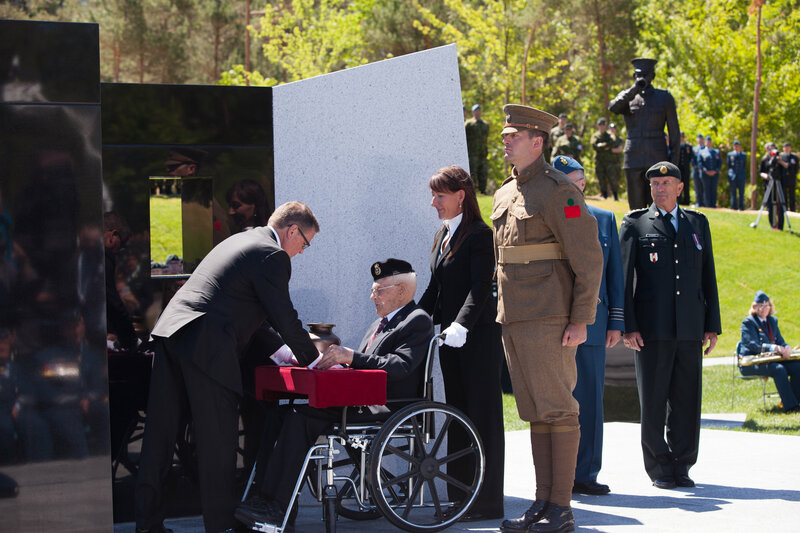 This is a moment that will be engraved in my memory forever. 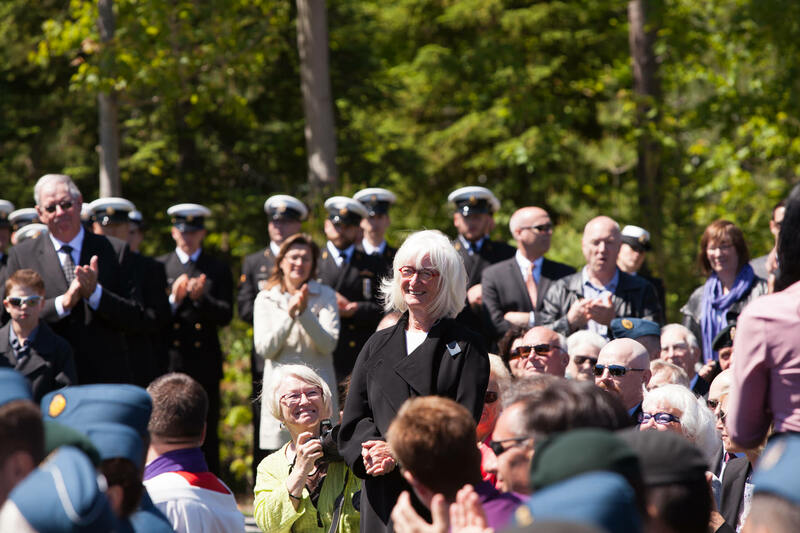 Documenting the Borden Legacy Monument unveiling was such an emotional experience for me. 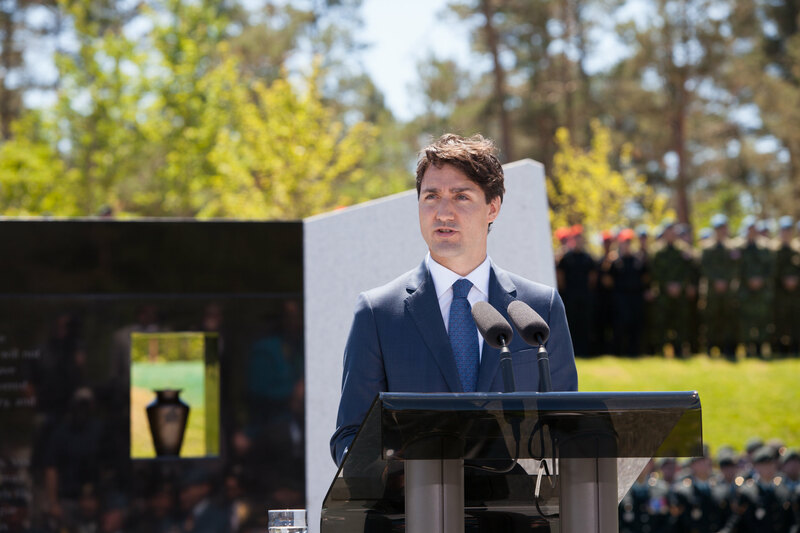 The energy in the air was something that I cannot put into words. 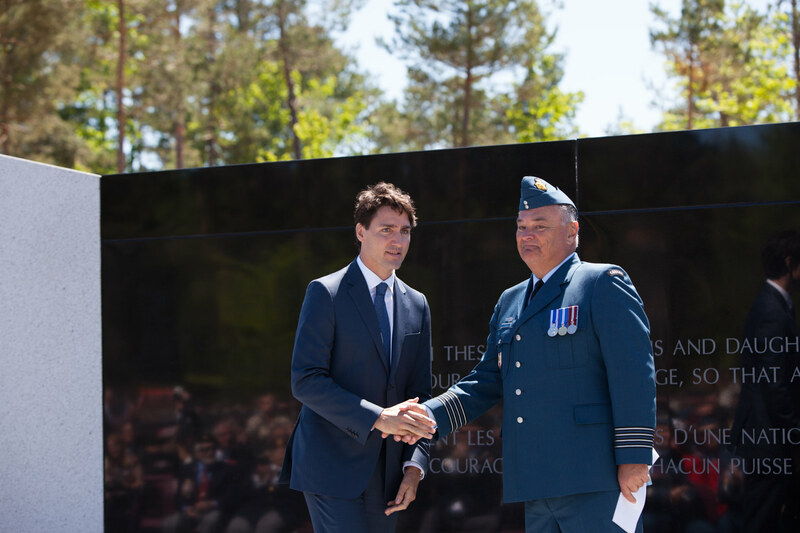 It was one of immense gratitude and appreciation for the men and women who have served and continue to serve our great country. 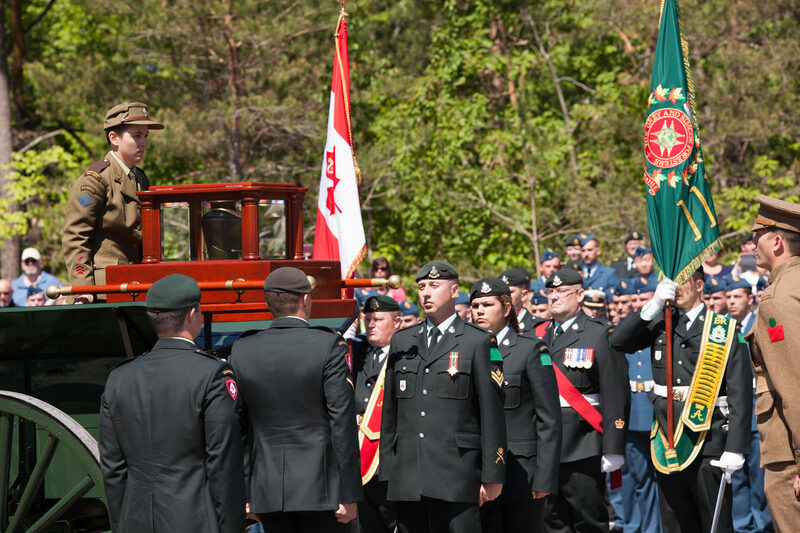 Today on November 11, 2016, we pause to remember and to honour all the Canadian men and women that have served and sacrificed for our great country.